I write in a “gratitude journal” during my early morning “Coffee and God” time (two things at the very top of my gratitude list!). I open it up and write down three things that I’m thankful for, just off the top of my head. I try not to overthink it. It’s an exercise in gratitude, and it helps me focus on the incredible positives of each day, rather than the niggling and occasional negatives. In looking over my journal this week, I was amazed at how many times I mentioned my garden. I mean, I have an incredibly blessed life. Yet over and over I added “my garden” to the list. It’s a pretty big part of the delights of my life, during the growing season, at least. 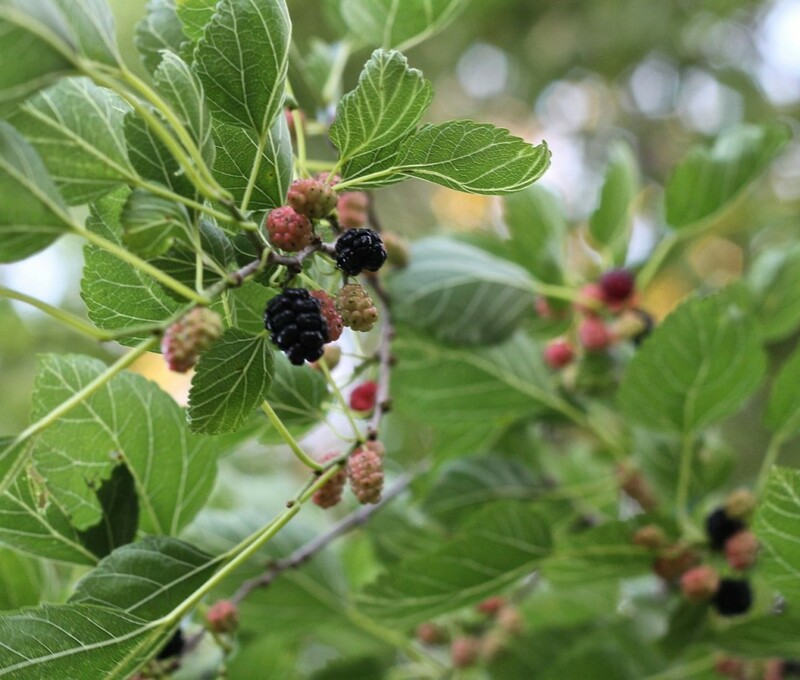 So I’m going to start a new series during the growing season, where I share what’s going on in my garden each week: what we’re eating, what we’re working on, what pests we’re watching out for, and whatnot. And I’d love it if you shared your garden with me, too, in the comments or with a link to your own website. We’re all in this together, aren’t we? And I’m so grateful for that! Pulling . . . We finally got a break in the rain, so we’ve been pulling the weeds that had sprouted up during the wet weeks. The ones that the chickens fancy I put in a tub and haul to them. The ones that they don’t I just lay in the paths, where they will rot and nourish the soil. Eating . . . sour pie cherries, baby bitter greens, last bits of lettuce from the hoop house, radishes, onion thinnings, herbs, salads out of everything and anything, wild mulberries, rhubarb, strawberries. Watching out for . . . the infamous harlequin bug has made its appearance in the greens and the horseradish leaves (of all places!) but is eminently squishable (little Mack’s words) and of course the cabbage moth has reminded me to cover the cabbages and kale plants with row cover. I’ve seen a potato bug or two, but they aren’t out in force yet. Leaving . . . as much volunteer dill as possible for the Swallowtail butterflies, as much Borage as possible for the honeybees, and as many milkweeds as possible for the Monarch butterflies. I’m all about leaving this year. 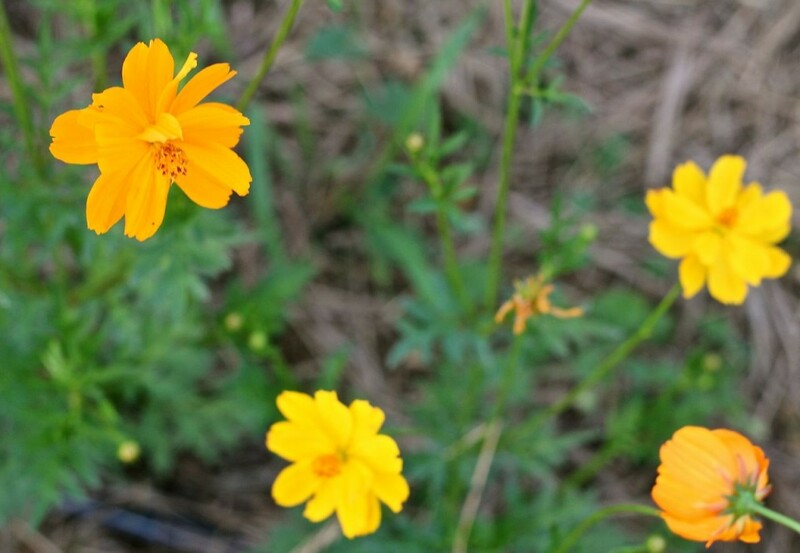 I have so much coming up from seeds that dropped in the soil last year–check it out, all these plants came up volunteer, and I either left several, or transplanted them to a new spot: cosmos, zinnias, coxcomb, tomatoes, dill, borage, milkweed, nettles of course, mint (mint never leaves, once you’ve got it). Mulching . . . with sheets of cardboard from the furniture store (for the paths), woodchips that my friend Larry the Tree Trimmer dropped off, and hay that our hayman Paul put up for us last summer. But . . . I’m almost–out!! Noooo! Putting up . . . sour pie cherries in the freezer, also rhubarb. Bryan is actually listening to me when I talk about getting a second freezer, instead of closing his ears and humming loudly like he has in the past. Especially as the Cornish Cross chickens grow in leaps and bounds. What’s going on in your garden? I’d love to hear about it. I learn heaps from you, Gentle Reader, and I just love it when you take the time to write a comment! Have a terrific weekend, and enjoy your garden! ← How to make Scrumptious Radish Sliders: addictive as all get-out! Your garden pics are really nice! I live in Oakland Ne, and we sure could use a little more rain. 🙂 I do like the wood chip mulch gardening method, and am slowly converting over. I don’t have access to tree mulch from tree trimming companies . But I will keep trying to locate some. I am truly thankful for my garden and all the singing birds, good insects and yummy food it produces. I am truly blessed! Enjoying your posts. So many blessings in a garden, Joanne! You may try to call your local tree trimmers. Ours will happily dump a load of chips (or two) every summer at our place, because it saves him fees at the dump. I suppose the pie that I make him every summer might tip the scales, too. 😉 Thanks for your comment! What a great looking garden and I like the different categories! Right now, here in south Texas, we’re at the end of corn season, some zucchini & cucumber (that’s not rotting on the vine from all the rain), and basil. Okra is growing, so hopefully we’ll have some for the 4th! I use whatever I can get for mulching, because for me it makes the difference between a garden that I can keep up with (the weeds!) and one that just gets choked out by weeds. 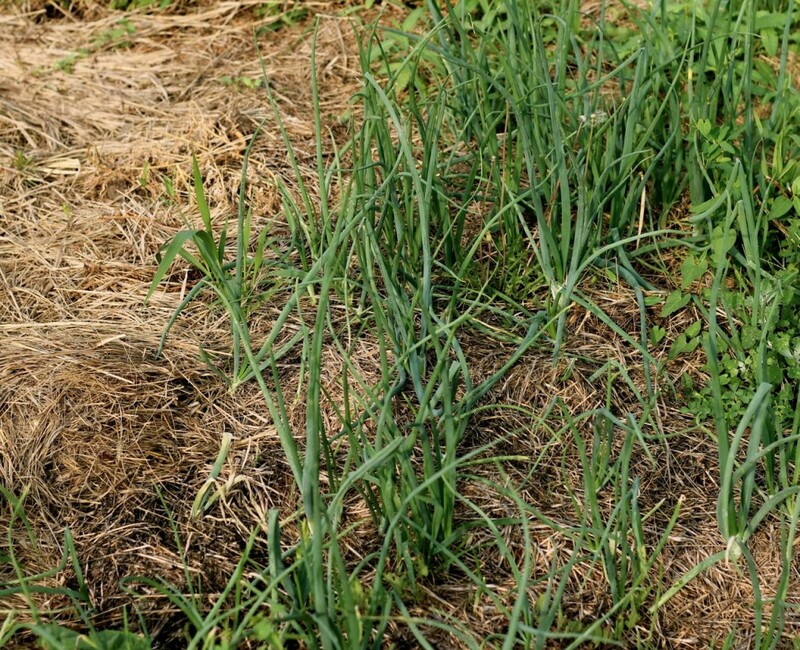 If you’re concerned about the hay, just use some in one corner of your garden this year and see what happens. If it’s a failure, then you’ll know. Likely if you pile it heavy enough, those nodules won’t come to anything. 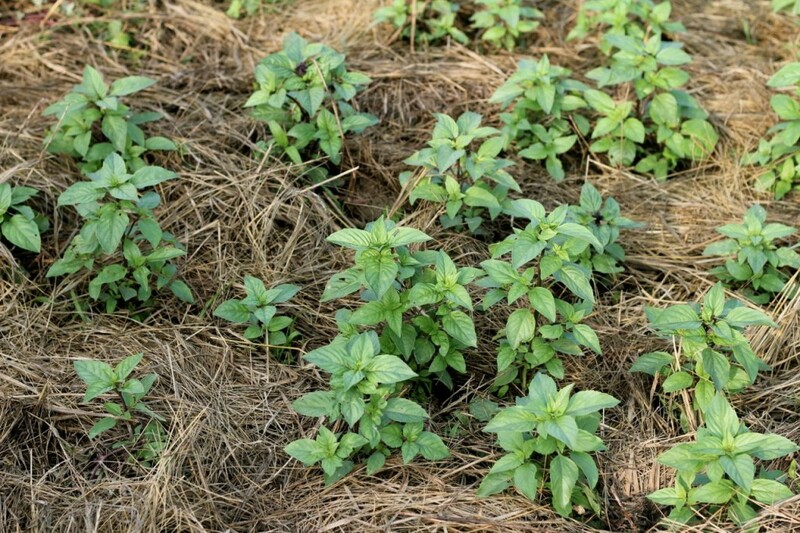 One year I bought “junk hay” from a local farmer that was cheap but full of weed seeds. I was desperate, so I went ahead and used it, but my heart sank as I watched those weed seeds scatter all over my garden! However, I piled the hay so deep that the weed seeds weren’t able to germinate (apparently) and I didn’t have a problem at all with it. Your garden is lovely. 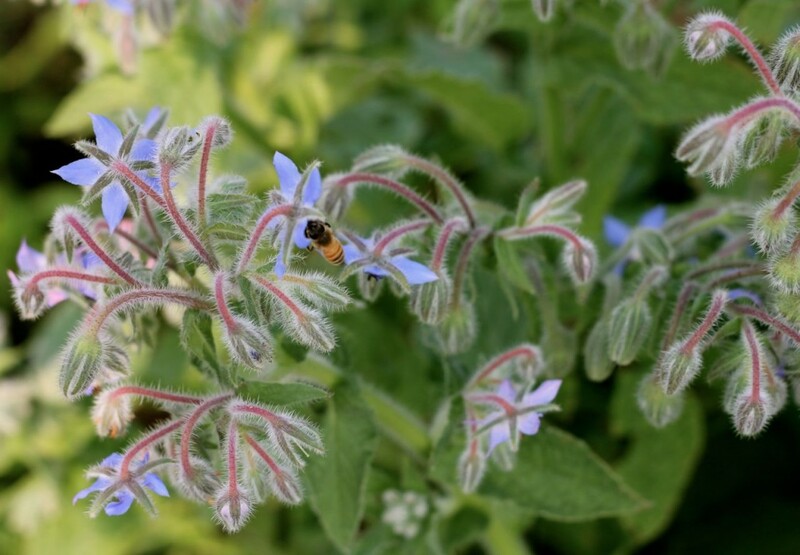 Enjoyed the borage with the bee. I’m so sorry; we’ve never managed to plant the borage seeds you gave us (hangs head). 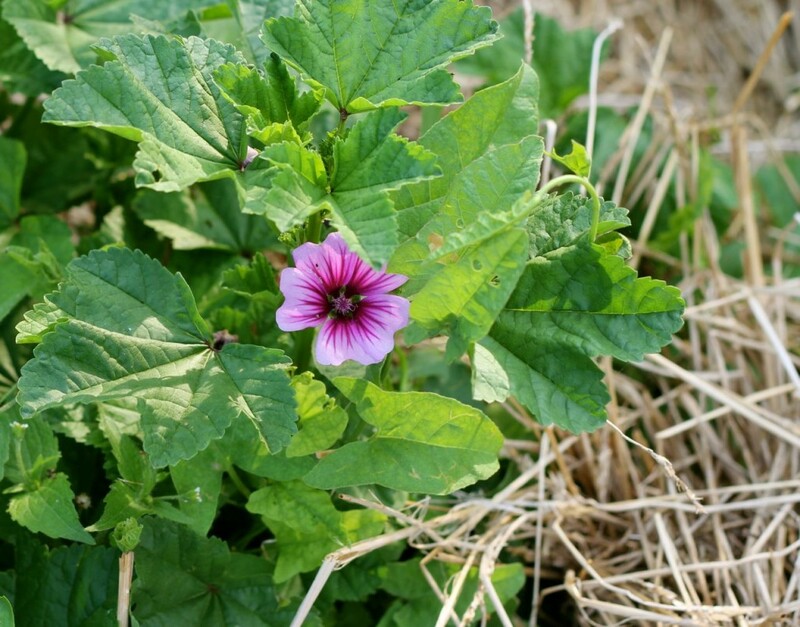 I enjoyed your Picasso petunia,too; it’s a type that has never done well for us. As for us: no pictures for a few days. Our caregiving trip for this weekend was cancelled due to the threat of heavy rains, so we visited our community garden for the second time in about three weeks. 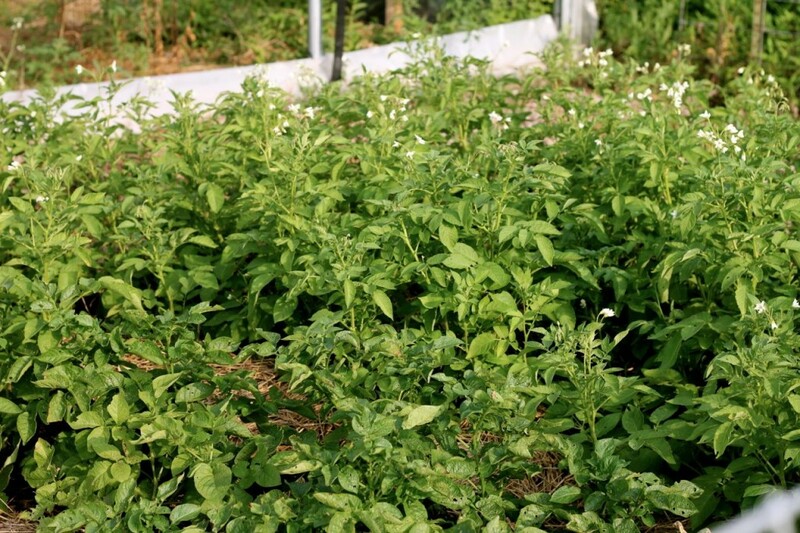 The plants are doing great thanks to the rain – so are the weeds! We pulled a bunch but then the rain started. Now we have a different project for this afternoon. I’m happy to hear you finally got a break in the rain, Amy-I hope you have no more standing water in your field. Again, greetings from upstate New York. We’ve had a long enough drying-out period, Alana, that we actually are longing for rain now. Isn’t that funny? Feast or famine. I’ve been watering heavily every day because it has been so HOT and the heat really dries out my garden soil. We ate green and yellow beans and baby squash today!! Granted, we kind of had to search for the beans amongst the weeds but oh they were delicious!! Oh, Jamie, I’m a bit late on the beans–they are just sprouting–but I can’t wait! I have no garden this year. (I thought I was moving.) Only statues on display in my front yard. I have strawberries in a pot. One sunflower growing from seeds dropped last summer. Maybe next year, eh, Sandy? 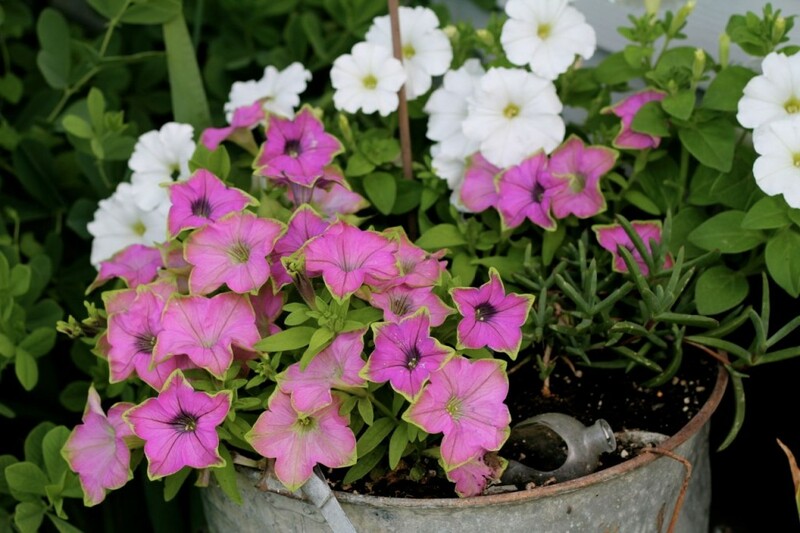 I’ve done lots of gardening in pots, too, over the years! I really enjoyed all the pictures. My garden is at kind of a standstill except for the weeding, which of course is never at a standstill. We are fighting the frogs because they will kill our dogs if the two get together and the dogs should bite them. That is an ongoing battle. The garden is smaller this year than planned because the people that lived here before us did some major reconstruction and all the bricks and cement was tossed in the area that will be the garden next year. It is a major “rock garden” at the moment. We are slowly removing the rocks, brick, broken glass, etc to find where the ground is. (about 8 to 10 inches below the rubble) We have planted a massive amount of fruit trees to add to those already here. I think the most fun is all the pineapple that we have planted this year, and of course my ginger, which is doing wonderfully. But now it is getting time for our trip to the states. We have someone to watch the garden, and as long as they remember the word “watch” includes pulling a few weeds, and watering when needed, we should be fine when planting season returns in November. Maybe next year we can share some pictures that are as nice as those you shared with us today. I have never heard that about frogs–those must be some poisonous frogs! I guess that’s something I have to be thankful for. We are battling mosquitoes, tiny grasshoppers, and harlequin bugs so far this summer, but no frogs! I’d love to see pictures of your garden someday. I just made it outside this weekend to take out my tomato stakes that were 5 ft. tall and replace them with 8 ft. ones. For some reason my cherry tomatoes always shoot up like rockets! 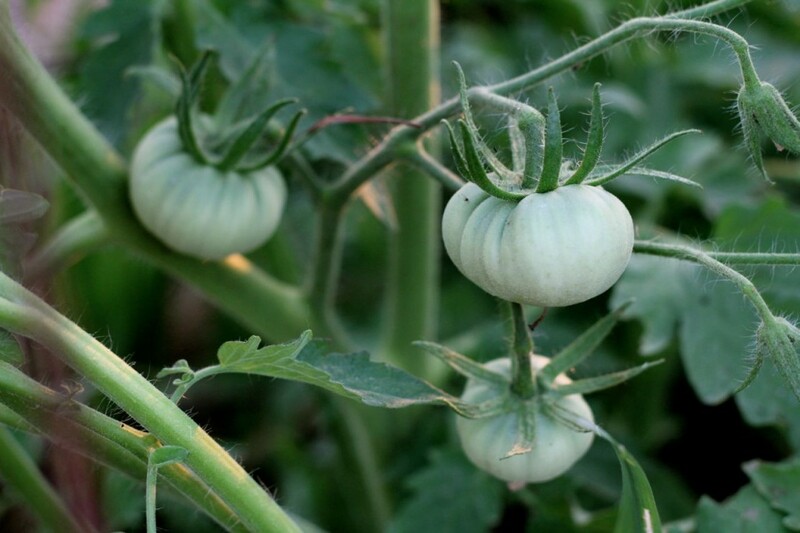 I have a small garden so I am very careful to grow things that can go “up” and not “out”, so my tomatoes get all their suckers taken off and are limited to a single stem. The pineapple tomato got away with having two stems because I can’t figure out which the main one was and they both have tomatoes started on them, I can’t bear to cut one off now! 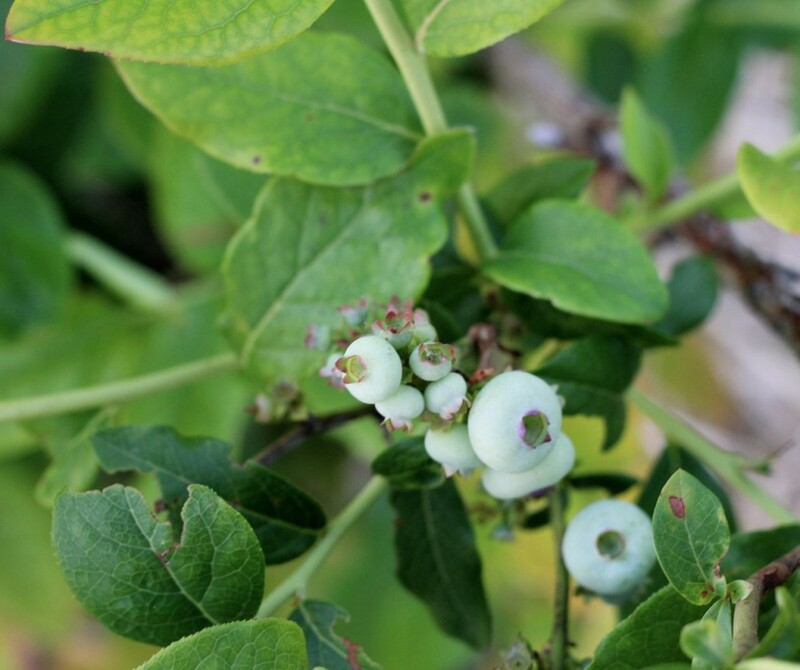 Thanks for your pictures, I love the blueberries, I think they are so pretty on the plant. I for one would love to hear about your garden regularly. My garden usually shows up in my prayers as something I thank God for, so I totally understand! I plan to do more garden posts this summer! 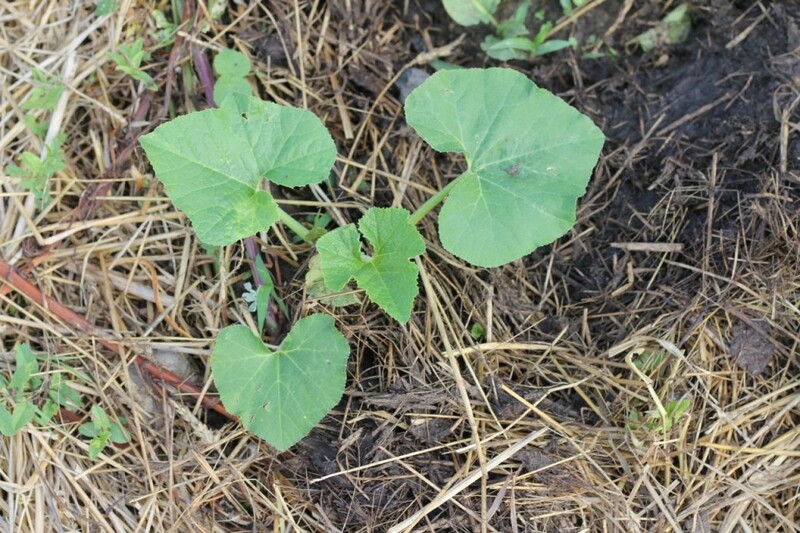 Here’s a tip for your squash borer battling: As soon as your winter squash have a long enough stem, mound some dirt on a new section of it, and it will take root. That way, if the squash borer gets to the main stem (that’s where the wasp usually lays its eggs) and it dies, the new part of the plant will still have a chance. Good luck, and let me know how it works for you. I struggle with borers every summer, too. Bla! Persian cucumbers?? I’ve never grown them! I’ll have to watch for seeds for next year. The pics of your garden are wonderful and show that you truly take to heart with your passion for gardening. I like to think that I have that same passion as well but this year has been quite trying for me and I thank the good lord that i can still get up everyday and put one foot in front of the other, albeit quite painful at times. This year i started 2 gardens, one that i have been working on for 4 years and a 2nd being the 1st year, the 1st one is 12 x 25 and the 2nd is 25 x 50. The bigger garden is what we call the canning garden which contains quite a few tomato plants, brussel sprouts ,cabbage, collard greens and 4 different varieties of beans as well as 5- 6 different pepper varieties, just to name a few. Both gardens are doing as well as expected with some of my plants doing better than expected. This year has been quite a learning experience for me trying to maintain both gardens basically on my own, but I know that the good Lord is helping me with the plentiful rain we are receiving as the bigger garden doesn’t have a soaker hose system installed like the smaller one has. All of my plants that I started indoors are performing well which makes me feel great, I am still amazed what grows from those tiny seeds and the enjoyment I get from canning and eating the results. My gardens have been a great therapy for my mind as they keep me quite busy and the feeling of success is very gratifying to say the least. I think most people who garden enjoy this feeling and those that don’t will never be as happy as we are. Thank you for all the info that you have shared with us, you have inspired me to make me a better gardener. BTW did you plant any Reapers? and if you did, how are they doing?